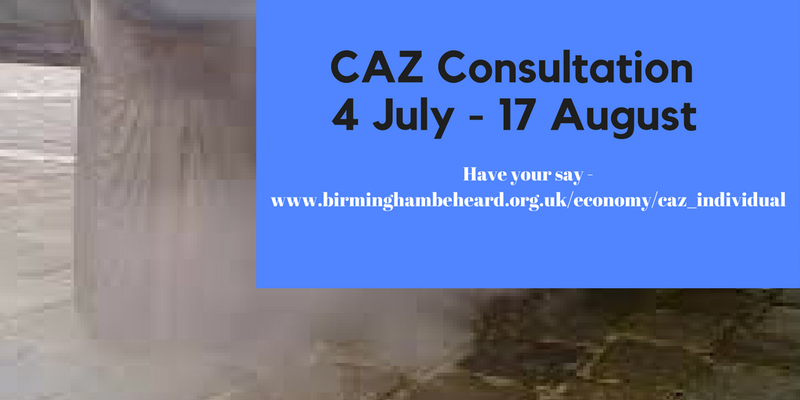 You may be aware that Birmingham City Council are currently asking for everyone’s views on introducing a Clean Air Zone (CAZ) by 2020. Air pollution levels now exceed the legal limits in a number of locations in the city, particularly within or near the area bounded by the Middleway (inner ring road) and this will only get worse if nothing is done. This is damaging people’s health. The CAZ is seen as necessary to reduce air pollution to below legal limits. How will the CAZ work? To tackle the problem of air pollution, the most polluting vehicles which enter the area bounded by the Middleway will be charged. This will apply to all types of vehicle including cars which do not meet the engine standards. We think it’s very important that as many people as possible have their say. Beyond 2020 more ambitious proposals are planned such as metro extensions and reopened railway stations. We believe that the city council’s consultation focuses too much on the ‘stick’ of the charging zone and does not pay enough attention to the additional measures or ‘carrots’which will be essential to reduce air pollution. The result will also mean less congestion and quicker journeys for all! It is not well thought out because the traffic would be diverted to surrounding roads causing extreme congestion and hence extra pollution which is not likely to stay out of the clean zone. living just outside the clean zone i am unable to afford the very high charge which should be close to one pound. Please allow vehicles to drive on the ring road free of charge. Th Council’s consultants have modelled the effects in detail and concluded that it will need BOTH a charge on the most polluting vehicles AND the additional measures to encourage clean transport, to have a hope of reducing dangerous and illegal levels of air pollution in the centre of Birmingham, to the extent and in the timescale available. This is because we are far behind most other large cities in providing alternatives to the car and therefore have to catch up quickly.